Last Date of submitting registration / application form for membership in these projects in October 4, 2013. Following are Bahria Town Offices Addresses in Pakistan, UAE and UK. Karachi Office:-Bahria Town Icon, Plot # 5, Near Abdullah Shah Ghazi Mazar, Shahrah-i-Firdausi, Block 4, Clifton, Karachi. Lahore Office:- Al-Falah Palaza, Sector B, Bahria Town, Multan Road, Lahore. Rawalpindi Office: Bahria Complex, Phase 8 Bahria Town, Rawalpindi. Hello sir I am chronic kidneys disease patient since 25years. My both kidneys are not work well. I did a lot of treatment but not cure yet from last 25years. Now doctors have been advised me dialysis or transplant operation but very expensive I can’t afford further more treatment very expensive. Due to my kidney disease my job is gone my home is gone. I am Married have 3 childrens don’t have any job. So please sir help me in my kidneys disease treatment. Save my life. My All family do pary for u sir whole life. I go to see day-to-day a few sites and websites to read posts, except this website offers feature based articles. Query No. 1. Please read our TWO Letters, you will find all detail or property. Plot is located in Rawalpindi. Allottee of subject Plot is serious ill, resides in Karachi and impossible to attend Bahria Town Rawalpindi Office, due to her illness, allottee wants for transfer of subject plot from her name to her daughter name, can Bahria Town Karachi office assist and facilitate the allottee, for above Transfer without going to Rawalpindi? or she needs to attend Rawalpindi Office? Please clear query. QUERY No.2. If, Bahria Town Super High way Karachi can facilitate, who is officer and what is his contact number, so that we may able to meet him and provide all documents. QUERY No.3. Please read our two letters and check in your system, what is Transfer fee, and other charges needs to pay to Bahria Town Ltd.
QUERY No.4. How much time Bahria Town Ltd will take for said transfer through Karachi office, without going to Rawalpindi office. Above query are very simple in nature, but hotline staff, counter staff super highway Karachi and GM OPS Phase-8 Rawalpindi is not understanding,you have send two papers, does not fulfill due reply of above queries hence, first read two letters and clear above query, sot hat our client may first pay all payment as required by the Bahria Town, and initiate above process through Karachi office without going to Rawalpindi. 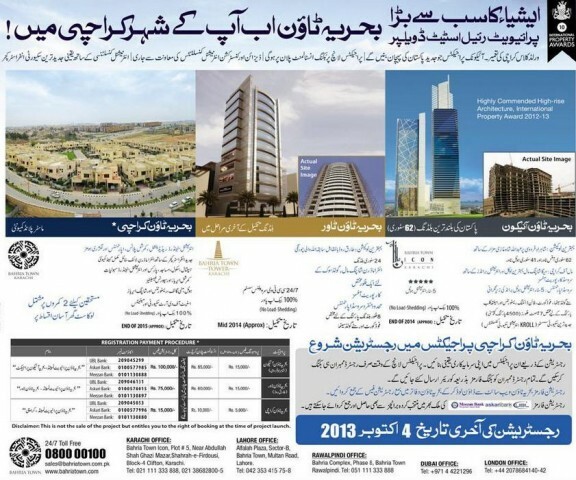 Also suggest the Board of Directors of the Bahria Town, to advise your all concerned staff to deal the clients / customers accordingly and avoid frequent refers to counter to counter or shifting reply liability to others, Mr. Khosnood Sahab is not coming in contact for last 10 Days, hotline telephonic conversation can hear by you and determine fact position. Kindly read our two letters first, and then ensure proper reply of four queries above without further loss of time. It is for your kind information please that the main commercial hub bahria town phase 8 dated 26-07-2016 after the night rainfall so many basement shops of some plazas breaks and damages the shop main wall mirrors and accessories are completely destroyed, the rain water stand some feet in basements shop etc, therefore we faced so many nuisance and loose not only shop keepers included shop’s owner. In main commercial hub bahria town phase-8, basement shops cannot plane sewerage drain system properly. We are requested to responsible department of bahria town to keep survey and prepared the damages & confirmed that we can’t faced any trouble again like this in future. (a) I have applied for Bahria Town Karachi and alloted with 125 Sq Yard Residential Polt having File No BTKP-FTY1922 which was blocked since Feb, 2016. I have already paid 4th and 5th Installment in Feb, 2016. (b) Application dispatched to Baharia Head Office in Feb, 2016 and photocopy of said application already submitted to Operational Manager Bahria Town Karachi Major (R) Farooq in April, 2016. Approach various times for subject issue but still no response from Baharia Town. (c) It is therefore requested to re-open the said File for further payment of installments and kindly update me on subject problem. Sir malik riaz it is requested to you that there were so many projects you ve launched or continue but why don’t you launch any housing scheme that will be in the range of poor or middle class people. Kindly consider this request and provide some lowest prices schemes for us. I would like to meet with Mr. Malik Riaz in Karachi. Kindly give me an appointment accordingly to his convenience. I need fully payment details of residential plot Sqrd 150 & 240. I Muhammad Habib, and I have already booked a plot vide registration No.BTKP – XDP3965, my aforesaid slip has been misplaced therefore continued I attended your office however your officer in charge has not taken against my application. It is therefore requested that look into this matter at the earliest. •	Indemnity Bond for Lost File duly signed and executed by me and duly attested by the Notary Public, original is enclosed herewith marked as annexure A. •	Copy of CNIC of the applicant is enclosed marked as annexure B. •	Copy of News paper publishing on Metro English Newspaper on 17-11-2014 is enclosed marked as annexure C.
•	Copy of Newspaper Paper publishing on Daily Jang Urdu Newspaper on 17-11-2014 is enclosed marked as annexure D.
•	Copy of FIR, from Korangi Police Station vide No.41, dated 11-11-2014 Original is enclosed marked as annexure E.
3. Further any documents required on the above circumstances please let me know for earlier production. 4. It is therefore requested that certified copy of Registration Slip/other documents may please be issued for our record. I could not see the last date for applying in Bahria Housing Scheme, Karachi. I myself has visited the side and impressed too much about the quality of work. I want to buy a plot having 200 sq yds and a bungalow 200 sq yds. I would be thankful if any positive response may be initiated from Bahria authorities. I could not see the last date for applying in Bahria Housing Scheme, Karachi. I myself has visited the side and impressed too much about the quality of work in process. I want to buy a plot having 200 sq yds and a bungalow of 200 sq yds. I AM A CIVIL ENGINEER WITH 20 YEARS OF EXPERIENCE. AM LOOKING FOR A JOB. WOULD BE GRATEFUL IF U CONSIDER. sir hum ne beharia town karachi ka master plane comuniti wala ghar khareedna hai. sir mere dono waldene gonge or behre hain. wo ye sasta ghar khareedn chahte hain. sir humen is ghar ke bare me kafi der pata chale jub ye project khatam ho gaya. sir humen beharia town ke us real estate ka number de den jo ye saste ghar wala project khareedte or bechte hon. teke hum khareedne keliye contect karlen.sir me or mere ghar wale app ke duago renge. How can i invest money in bahria town projects? I want to apply in your organization so please guide me how apply? I want apply low cost sceheem sent me proceeger and payment schedule. & i want to know about the location of housing scheme. I am interested in low cost housing scheme. Kindly send me its total cost, payment schedule and location of the project. I would really appreciate if I am given a registration form. and tell me where to get the form in karachi. Bahria Town Karachi offered its registration. Hi im looking to purchade 2 bed Apt in bharia town khi if u have any details plz provide me im intrested. I want to know about the location of housing project. I want to know about the location of housing scheme. I want apply low cost sceheem sent me proceeger and payment schedule?